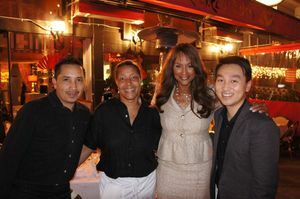 Beverly Johnson and the Baker Street Bistro staff. Photo from Facebook. The ever-gorgeous supermodel ~Beverly Johnson~ and friend Robert Dupont (one of the famous identical twin brothers making the scene during the era of Andy Warhol’s Factory and Studio 54) came by Baker Street Bistro for dinner on Saturday night after attending the Halston movie, Ultrasuede: In Search of Halston (which they featured in). They both had the French onion soup, escargot Bourguignon, and the bistro’s famous moules frites. The crew from Beverly Johnson’s Full House, a new show on the Oprah Winfrey Network, was on site to film the dinner.